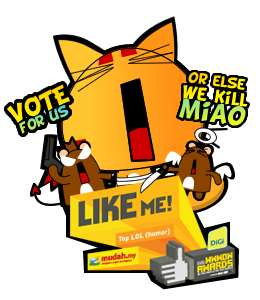 Do vote for us ya.. Thank you thank you..
Posted on June 15, 2011 by Jian Akiraceo. This entry was posted in Ofix and tagged nose water, Sneeze. Bookmark the permalink. Wipe on his face, then shake. That way he’ll remember you FOREVER. Bwohohoho! Keep tissues at your desk! I think I would just say hi and tell him sorry, my hands are dirty…so don’t need to shake hands. Show your elbow instead hand lor. I would just say, helly, sorry, on my way to wash my hands, and not shake.. coz ewwwwww germs!!! I dun really like shaking people’s hand anyways.. you never know what they touched before.. YUCK! !